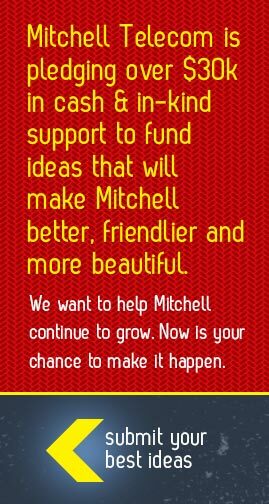 Decide which category your ideas fits into and fill out an application to show us why we should choose your idea to improve Mitchell. * We've reach the end of the submission period for the live applications. Thank you for your entries! The focus of this category is to fund projects that will improve the quality of life in Mitchell. It could be a recycling program, a community arts program, a community garden - anything that would help improve our quality of life, making Mitchell prettier, safer, or more enriched. Your prize could be up to $5,000 from a total prize pool of $7,500. Submissions will be accepted until September 3rd. * We've reach the end of the submission period for the work applications. Thank you for your entries! The focus of this category is to help entrepreneurs in Mitchell start and grow their business. From homemade sausages to developing your own app, we want to help you break through the barriers of starting your own enterprise. The funded project will receive $5,000 in funding, plus will have the option to accept in-kind funding (access to free warehouse and office space, and free broadband and phone service for 12 months). Submissions will be accepted until September 16th. * We've reach the end of the submission period for the play applications. Thank you for your entries! The focus of this category is to fund projects that will make Mitchell a better place for our youth. If you'd like to develop a summer camp, improve athletic facilities or create a new reading program, this is your category. Let's improve and add to the opportunities for our children. The funded project(s) will receive up to $5,000 from a total prize pool of $7,500.